Teeth whitening has become very popular. There are many different ways to whiten your teeth, from in home whitening kits to different treatments at the dentist’s office. The newest and quickest way to whiten teeth is a procedure performed at the dentist’s office involving a laser light. This procedure is referred to as Zoom whitening. Zoom teeth whitening is a procedure performed at the dentist’s office by your dentist or a trained clinician. It is considered to be the fastest and most effective form of teeth whitening. The process usually takes under an hour from start to finish. Before your appointment for Zoom your dentist will usually schedule a regular cleaning and ensure that you don’t have any current dental problems that need to be addressed first. The first step is to be sure your lips and gums are covered. This will keep the whitening solution off those areas and keep it only on the teeth. Once the teeth are exposed a special hydrogen peroxide whitening gel is applied to the teeth. Then a special light developed to activate the whitening gel is aimed at your teeth. You will need a total of 3 coats of the gel for this procedure. The gel is removed after 15 minutes and a new layer applied twice. After the last 15 minute session a special fluoride gel is applied. This gel is used to reduce any sensitivity that the whitening gel may have caused. Before you go home you will receive a special Zoom whitening touch up kit to take home. The kit includes trays that are custom fit and whitening gel. You dentist will explain how to use the kit to keep your teeth white longer. Zoom is the fastest procedure to whiten teeth. You see results immediately after the procedure. 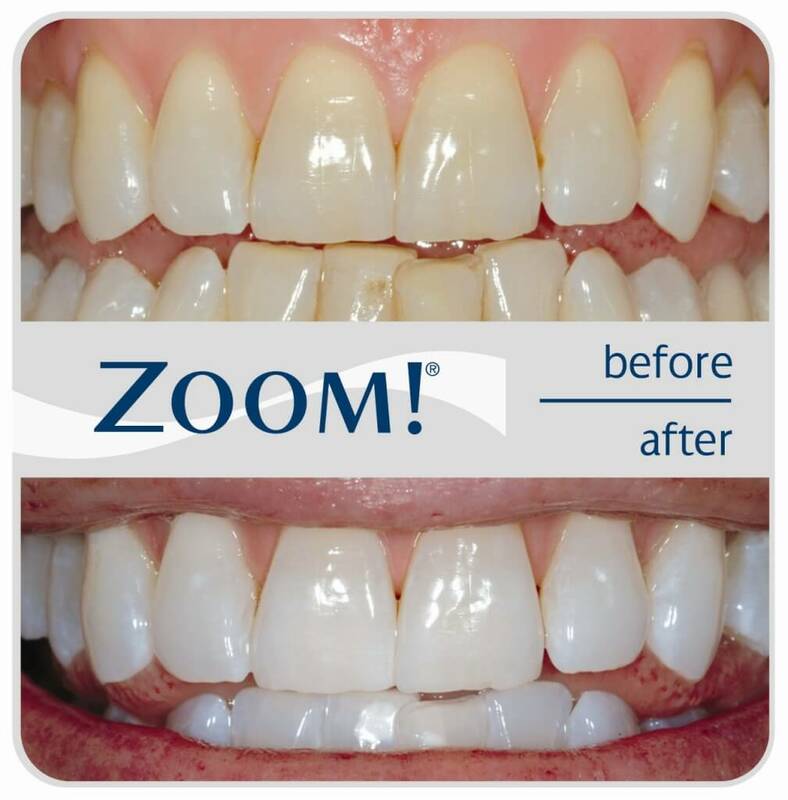 Zoom provides the best treatment for teeth whitening and can lighten your teeth up to 10 shades lighter. Zoom is customizable so you can pick which shade of white you prefer. So you have a choice to go only a few shades lighter or make them so white they are almost translucent. Zoom teeth whitening lasts a long time. You get the take home kit for touch ups which allows you to extend the length of time Zoom keeps your teeth white. Zoom is a safe procedure and has very few side effects, the main one is tooth sensitivity which is why the special fluoride gel is applied after the procedure. If you still suffer some sensitivity it will fade quickly. The procedure is very comfortable for patients. Zoom is performed by a dentist or specially trained clinician who will monitor the procedure and ensure nothing goes wrong. The whitening gel penetrates the tooth enamel to be able to remove difficult stains that at home kits are unable to remove. Whiter teeth can help to boost your confidence. You will not longer have to be afraid to smile in front of others. Like any product the cost for Zoom varies depending on where you go to have it done. It can cost as little as £200 and as much as £1,000. The average price is £300. If you are thinking of having the procedure done be sure to talk to your dentist fist. Zoom is usually performed by a cosmetic dentist. If your dentist does not provide Zoom whitening he can usually recommend a colleague to perform the procedure. The costs varies depending on the type of staining on your teeth and also on how badly stained your teeth may be. Some people include the cost of other dentistry work that needs to be completed before the Zoom process can be applied. That is one reason for the variation of cost. One thing to remember when considering the cost, is that Zoom whitening usually keeps your teeth white for a year when the take home kit is used for touchups. With that in mind the cost figures out to about $1.36 per day if you pay the average price of $500. However, teeth whitening is usually not covered by insurance. Many dentists allow for a payment plan or special financing to help your cover the cost. If you are unsure as to whether or not you want to have your teeth whitened with the Zoom procedure you can look up reviews from others who have had the procedure. Be sure to read plenty of the reviews to get a really good idea of what others think. The main reason some people do not like the procedure is because they suffer from sensitivity after the procedure. This usually only lasts a few hours for most people. Many who say they had the pain, which they refer to as “zingers” say the pain they suffered after the procedure was worth it because they love the results of the procedure. Others state they never had any of these zingers and are very pleased with the result. I looked at many review sites to see what people who have had Zoom felt about the procedure. Below is a summary of some of the reviews I read. One person from Melbourne stated that she was only able to complete the 39 minutes instead of the 45 because her mouth became too sensitive. However the zingers only lasted for about 7 hours and she was very pleased with the results. She finished by saying that she felt the little pain she suffered was minor compared to how white her teeth were and she felt the procedure was worth it. Another person from Minnesota stated that her teeth were 8 shades lighter after the procedure. She did have a few zingers but felt the little pain she had was nothing compared to the results she received. Someone from Maryland said she did not see much difference when she was at the dentist’s office, however when she took some pictures she could see how much whiter her teeth were. She was also pleased that the staining she had from some minor teeth crowding was also gone. A person from Nevada was very pleased with how white her teeth were after Zoom. However, she felt the pain was too intense. For that reason she felt the pain was too bad to consider the treatment worthwhile. Zoom whitening can lighten your teeth better than any other procedure. It is relatively fast and the procedure lasts less than an hour. The results can last up to a year. While some people do experience for sensitivity problems the do not last long and they are very happy with the results. If you are consider having your teeth whitened talk to your dentist about the Zoom procedure. Talk about the possibility of suffering from the zingers and ask for recommendations as to lessen the pain from the zingers. Remember that any professional teeth whitening procedure can cause this sensitivity. Over the counter products cannot give you the same results as a professional treatment. Whether your teeth are badly stained or just yellowed Zoom whitening is the fastest, most effective teeth whitening procedure.